We are delighted to announce that in Spring 2019 we will be opening our sixth Little Forest Folk nursery in... Twickenham! Our Twickenham waiting list is now open for intake for 2019. See how to sign up to the waiting list below. We are so excited to be bringing our Little Forest Folk magic to yet another area of South West London. Every day we meet our full day children at Heatham House in Twickenham for breakfast. We greet our friends, enjoy a lovely breakfast and a play sparked by curiosity and exploration before getting ready for our forest adventures. 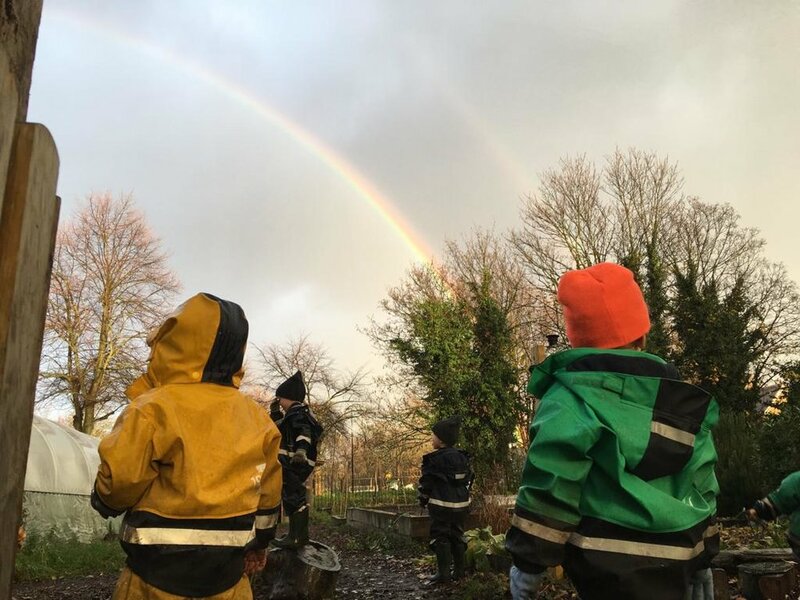 Once we are dressed up in our wellies and waterproofs it’s a short walk into our magical woodland garden area, where children have free rein to explore, play and have unbounded adventures in a natural wild setting. Our play is child-led and play-based. Children's imaginations are the only barrier to a day at Little Forest Folk and they are encouraged to run, imagine, create and reflect. We use our environment as our third teacher with resources being primarily natural materials which create provocations to stimulate highly engaged play through fascination, awe and wonder. Our forest site is approximately half an acre and consists of a variety of vegetations and areas to engage the children’s imaginations. We additionally have a cosy sleeping tent for children still needing a rest in the middle of the day and of course our all important fire circle where not only marshmallow toasting but often the most amazing conversations happen. There are two options for attending Little Forest Folk Twickenham, a Full Day (year around) or a Sessional Day (term time only). Full Days run 8am to 6pm (apart from on Fridays where we finish at 3:30pm), include breakfast, lunch and dinner, whereas Sessional Days are shorter days running 9.30am to 3:30pm, that include lunch. Both include a morning and afternoon snack. We ask for a minimum commitment of at least two days per week per child. We will be based at Heatham House, in Twickenham and we are lucky enough to have both our indoor and outdoor space all on the same site. We have our very own woodland garden which is approximately one acre in size and is adjacent to our indoor building. We are located within very close walking distance to Twickenham train station. Interested in taking a look around? We will shortly be announcing our Twickenham open days, we can’t wait to meet you and show you our brand new Little Forest Folk location! Sign up to our newsletter and we can let you know when our open days are available to book. We are finalising our fantastic Twickenham team members and we look forward to introducing them to you very soon! Your child is able to access 570 hours of free entitlement hours funded by the government from the term after their third birthday. This funding can be applied across the school terms (38 weeks per year) or stretched to cover a longer period of the year (51 weeks per year). There are two options for attending Little Forest Folk Twickenham, all year round Full Day or Term time only Sessional Day. Full Days include breakfast, lunch and dinner, whereas Sessional Days are shorter days that include lunch. Both include a morning and afternoon snack. We ask for a minimum commitment of at least two days per week per child. We run holiday camps during school holidays at our Twickenham nursery. We have a limited number of places per day so if you would like your child to attend, we would advise booking as early as possible to avoid disappointment. Our Twickenham waiting list is now open for 2019 intake. Our Spring 2019 intake is now full, please join our waiting list below for a place September 2019 onwards. Children must be at least two years old to join Little Forest Folk. We ask for a minimum commitment of at least two Full Days or two Sessional Days per week per child. We ask parents to pay a £25 deposit at the time of joining the waiting list. This fee is to secure a place on the waiting list only and is non-refundable. An enrolment fee of £150 is required upon registration once a place has been offered. This includes a set of high quality Didrikson’s waterproofs for your child. To join the waiting list for 2019 intake, please complete the relevant form below. Your child must be between the ages of 2-5. Are you on one of our waiting lists already? Please let us know the location and date joined, we will be offering existing waiting list families first priority for places at our Twickenham site. We look forward to welcoming you to Little Forest Folk!